The winter solstice is the longest (and sometimes the darkest) night of the year. 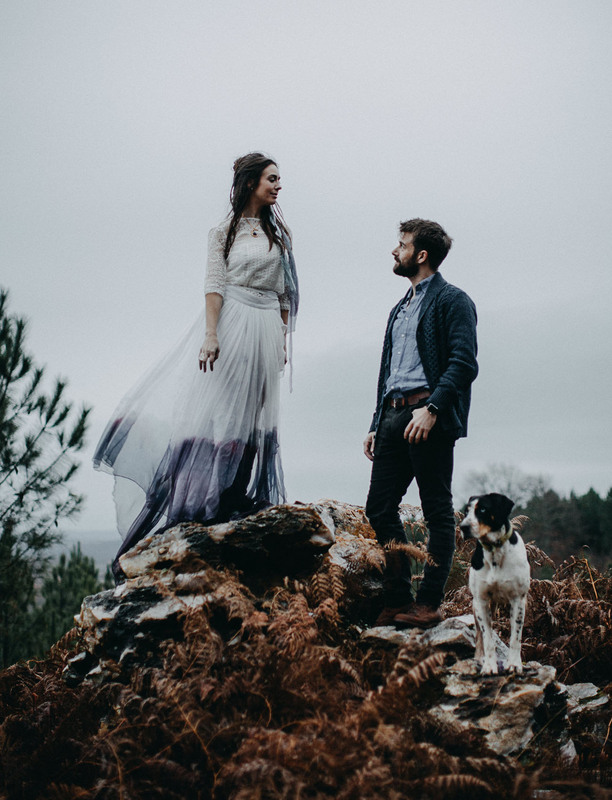 However, it also represents a turning point… the great stillness before the sun’s strength builds, when days will grow longer, and the light will once again illuminate the land. 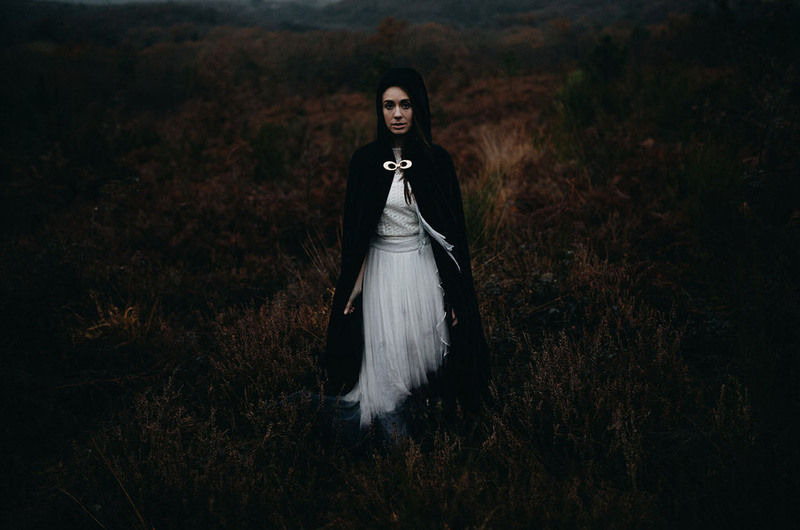 With that darkness brings out a time of reflection, contemplation and connection. 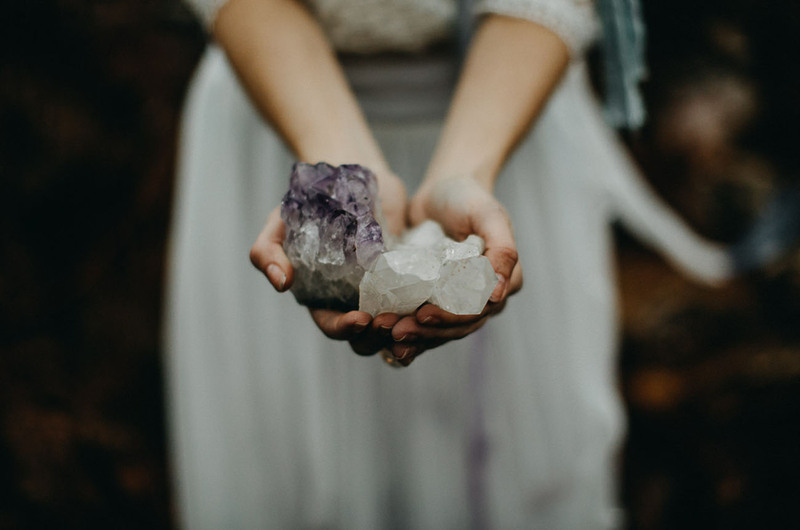 Though it’s a celestial event, it’s also a time deeply connected to the cycle of the earth itself. 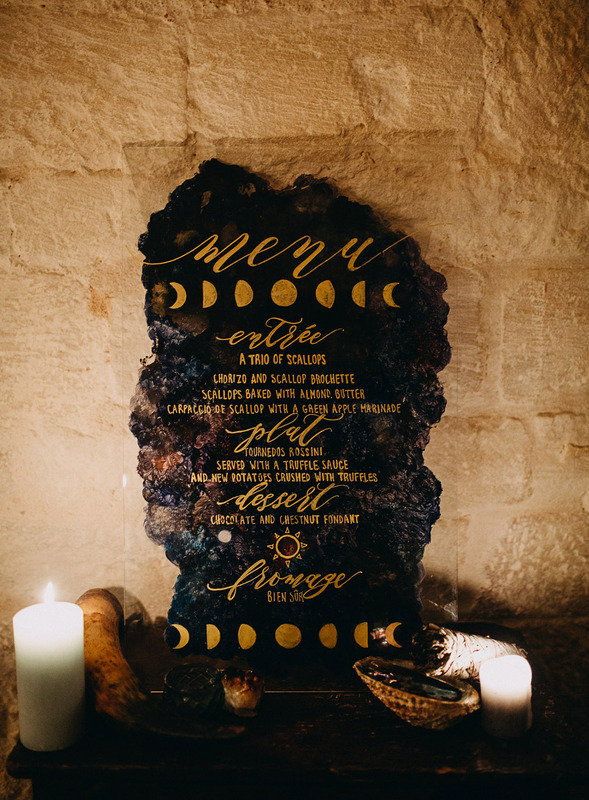 Inspired by this, photographer Stephen Liberge teamed up with event designer + planner, Oui, Mon Coeur, to bring us this juxtaposition of celestial elements with earthy ones. 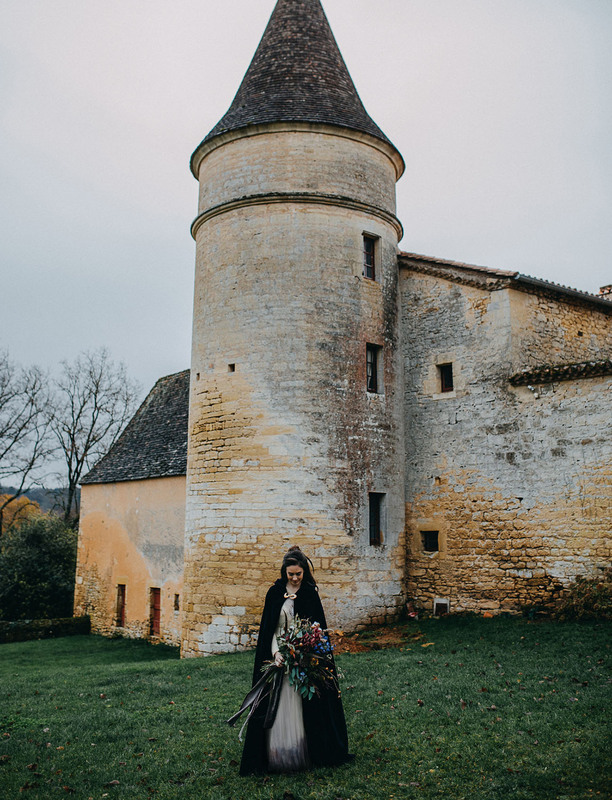 Oui, Mon Coeur shares Combining wild panoramas and ancient woodlands, with high end beautiful artist-designed interiors, Château de la Bourlie provided the perfect mystical setting for a winter solstice shoot. 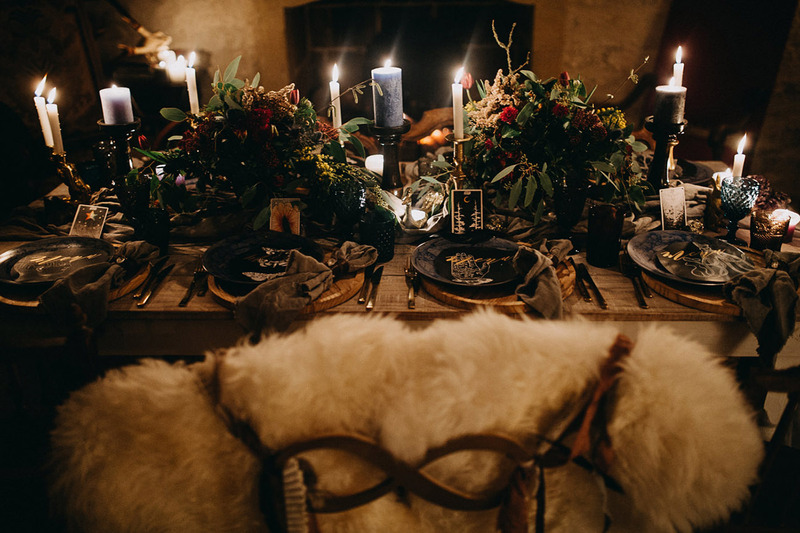 We focused on the feelings of rituals + revelry, along with feasts and fires…. 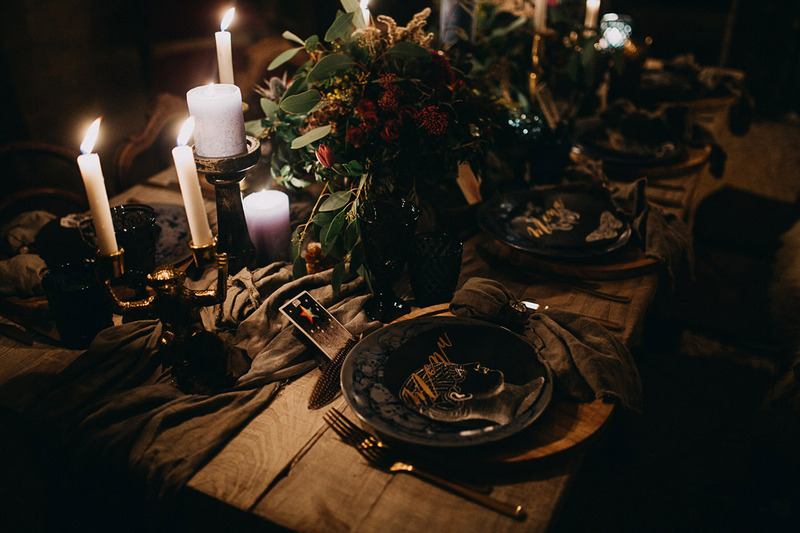 We also wanted to bring in some mystical elements, Tarot imagery, crystals, and a bit of winter magic. 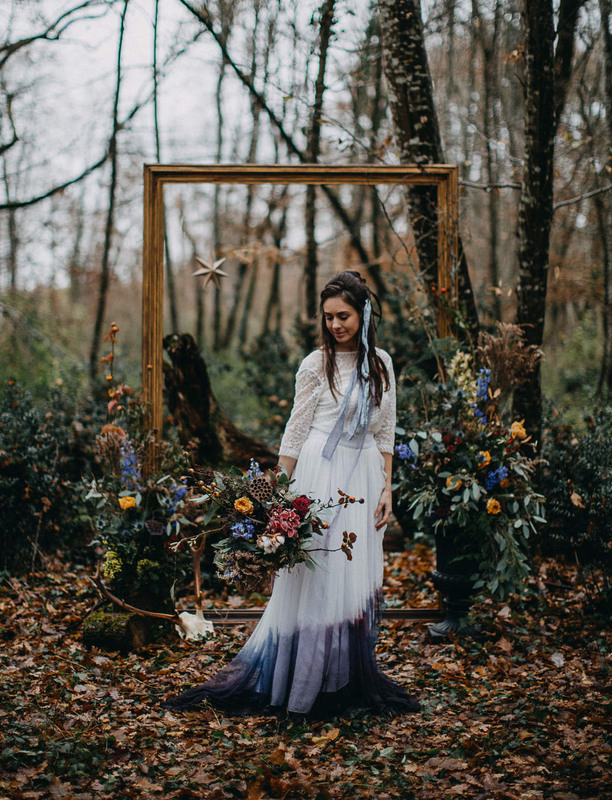 Kicking off the day, the bride’s handmade lace Petites Robes Blanches top features a sun motif, while her hair and bouquet are tied with plant-dyed silks and velvets. 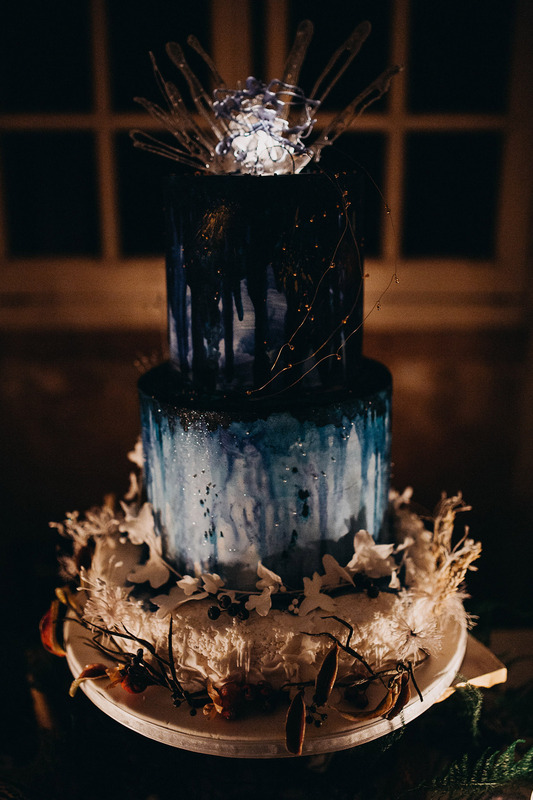 For the visual side of things: we welcomed midnight and navy blue as the color of choice for weddings in 2018, as a change from the softer colors so popular for French country weddings. 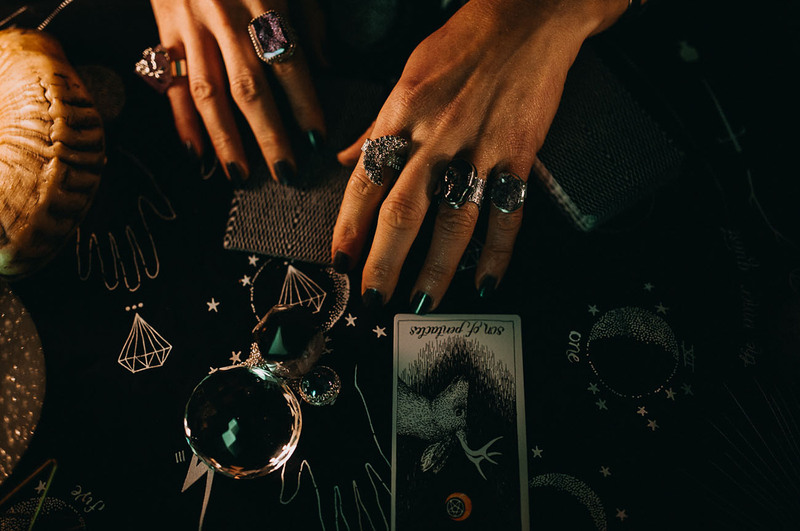 We’ve also been completely enamored with Dior’s recent Tarot-inspired collections – from ball gowns and handbags in S/S 2017 to the most recent Cruise collection for 2018 featuring images from the Motherpeace Tarot Deck. It was those colors that we centered on. 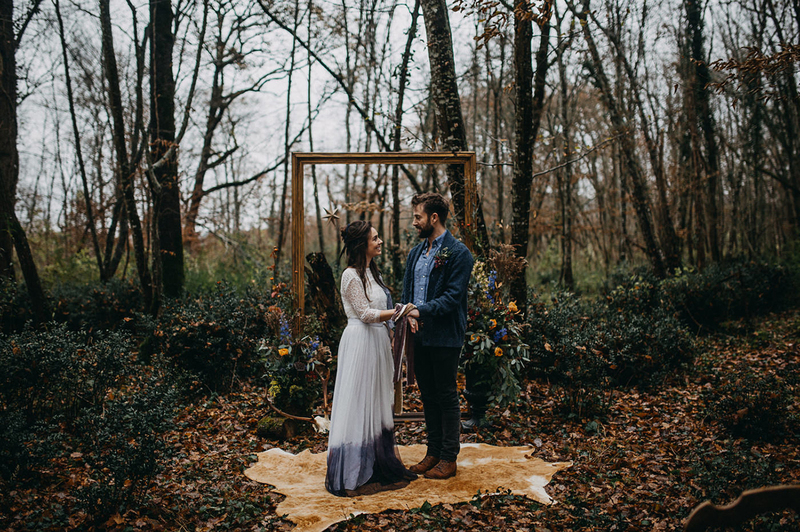 Such a cool inspiration for the visuals… And we love the way they tied in a pop of color to the bride’s outfit with the dip-dye skirt by Adeline’s Grace. 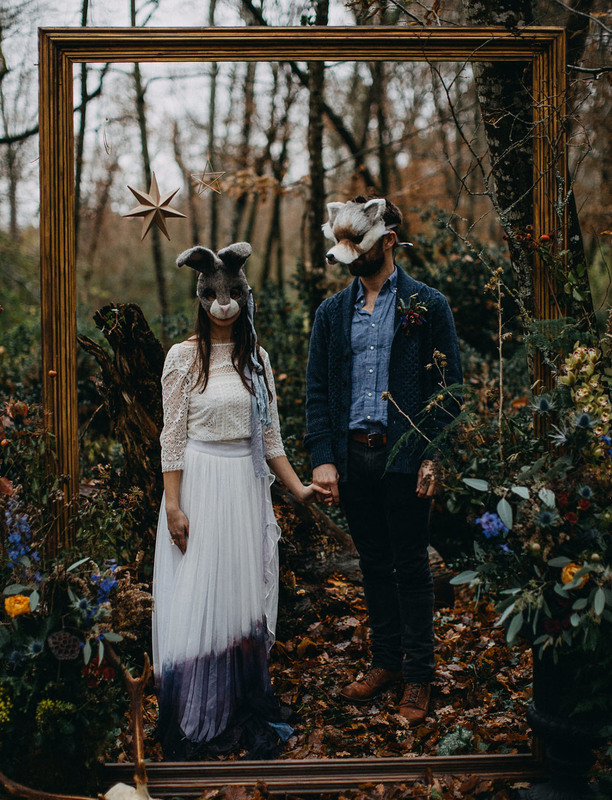 As for those Another Earthling animal masks? 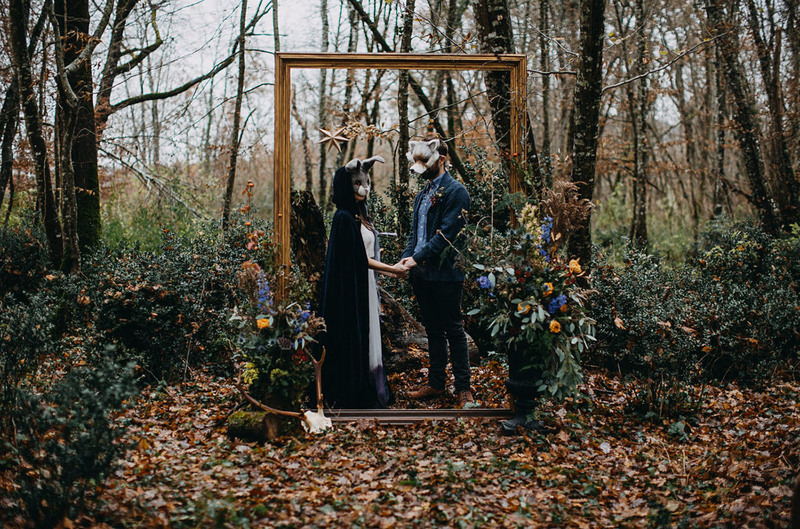 The Tarot cards that served as inspiration for this editorial featured a lot of animal and nature imagery, thus they wove in animals where they saw fit! 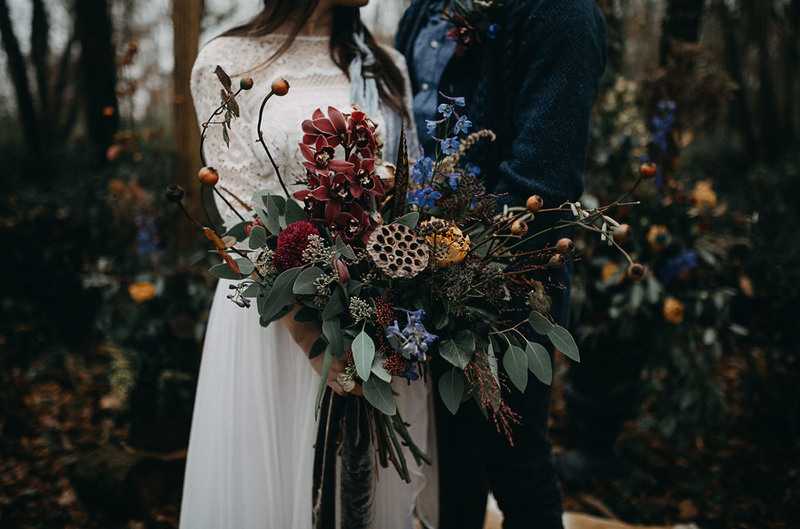 Replete with greenery and darker textures, foraged foliage served as a base for more exotic blooms in deep rich tones, accented with feathers, cotton, rose hips and oak leaves in this bouquet by Agnès Laye Fleurs. 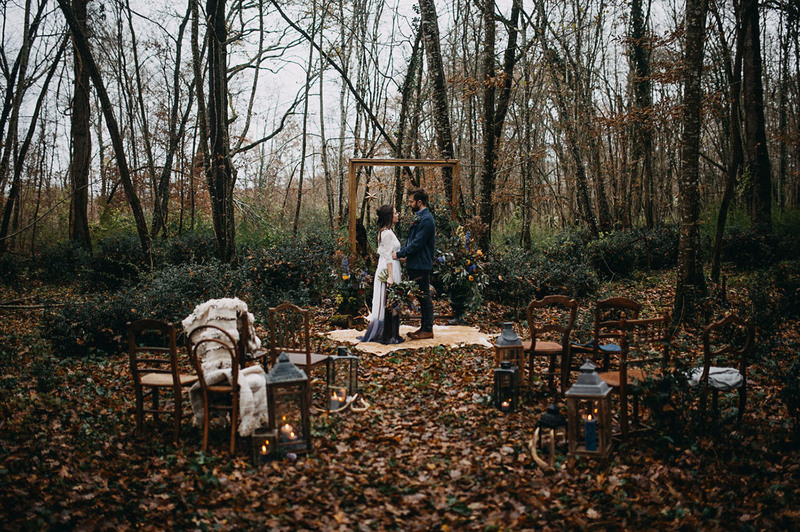 The idea started with a vision of the couple having a brief outdoor ceremony (cozy blankets at the ready) in the château’s surrounding forest, to connect the day to the natural world. 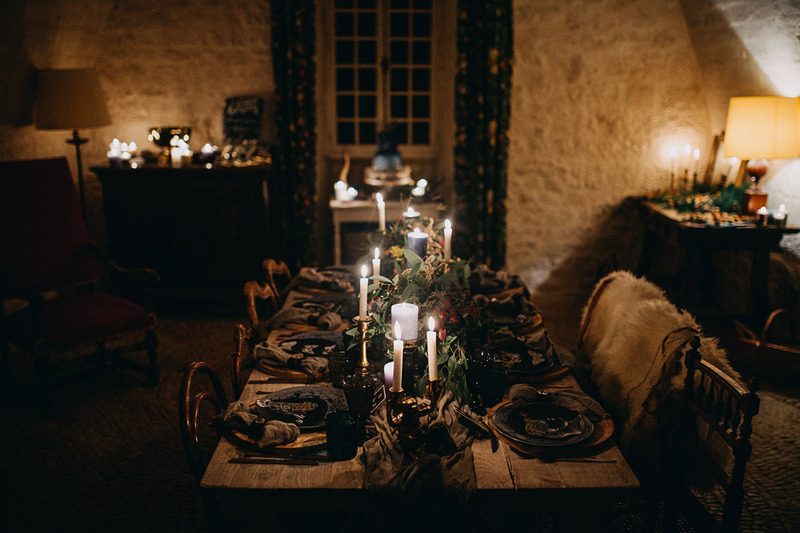 After the ceremony, the party cozies up inside the château’s thick stone walls for Tarot-themed cocktails and hors d’oeuvres made from local and seasonal ingredients… Enjoyed, of course, in front of a roaring log fire. Um, where do we sign up? Yes, please! 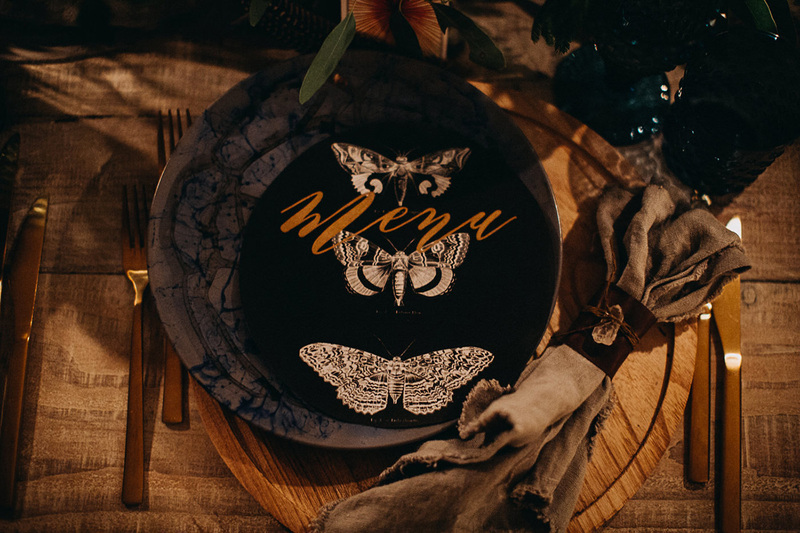 The bride donned celestial-inspired jewelry by La Boboa, which featured raw, earthy crystals. 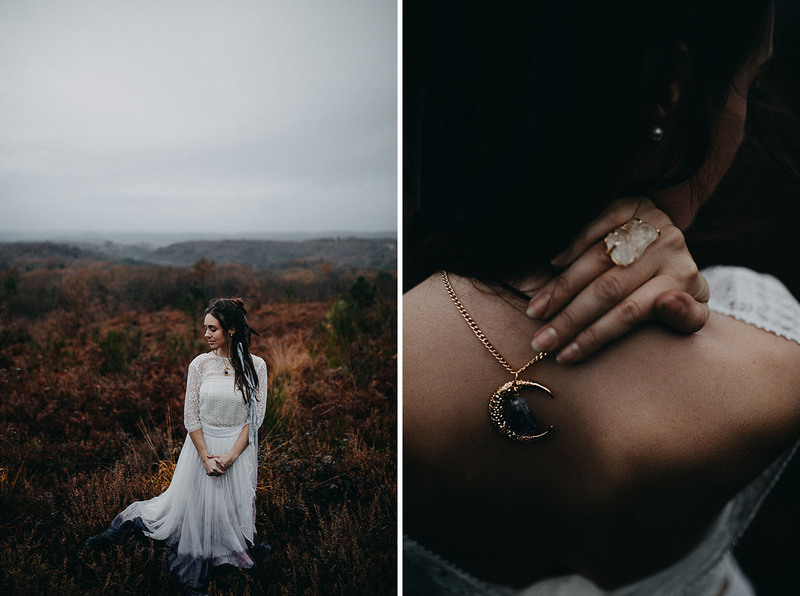 We’re kind of *in love* with that crescent moon necklace! 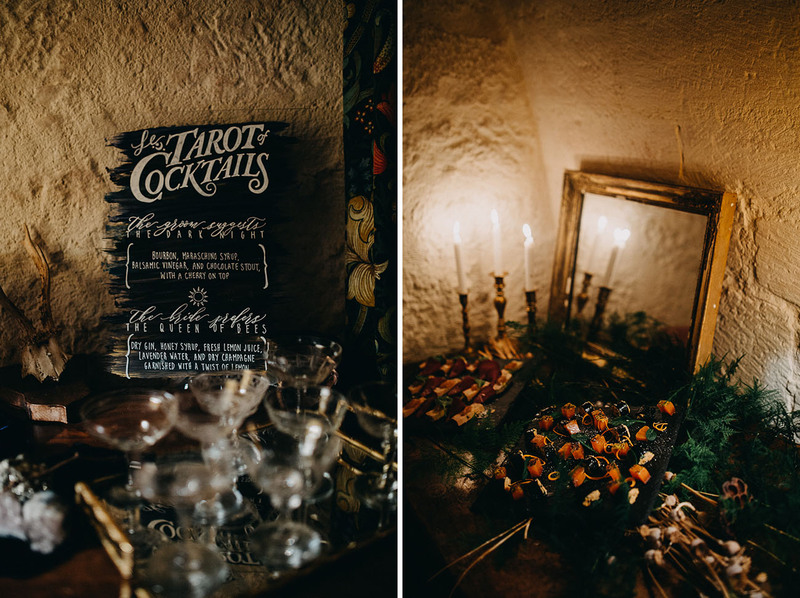 The evening followed with dark and moody cocktails, inspired by Tarot cards themselves! 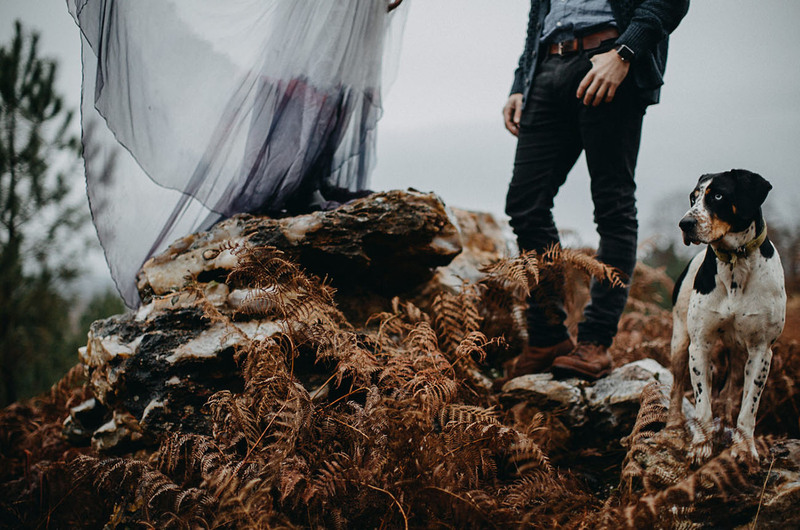 Enchanting, isn’t it? 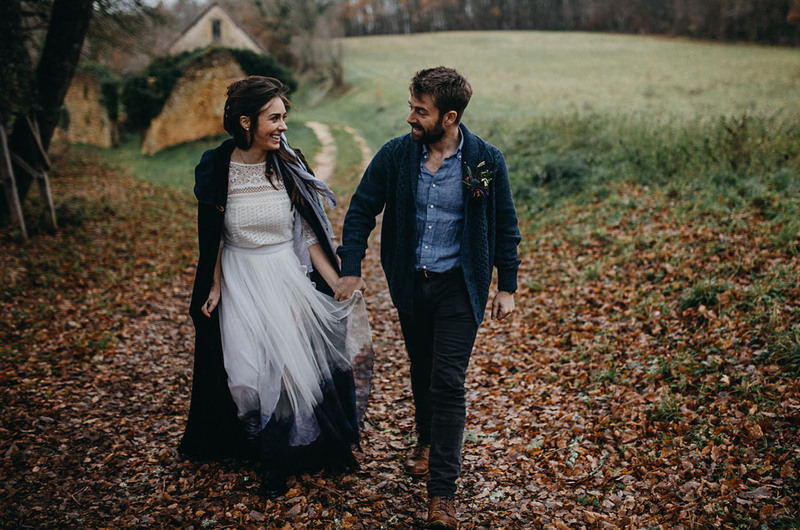 Thank you so much to Oui, Mon Coeur for sharing this gorgeous winter editorial with us. 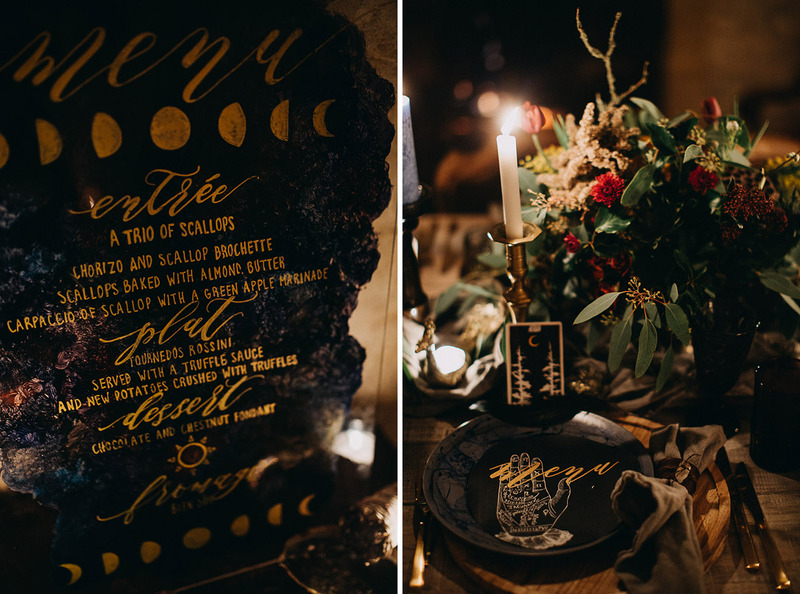 A Sparkly + Glam Holiday – with Unicorns! 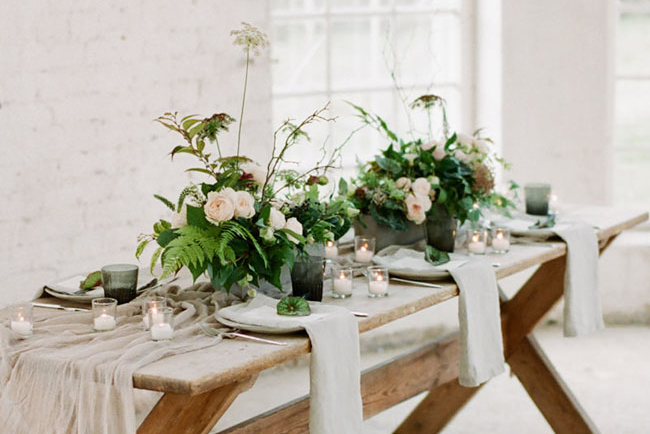 So lovely to see our work on your blog. Thanks so much for the share! 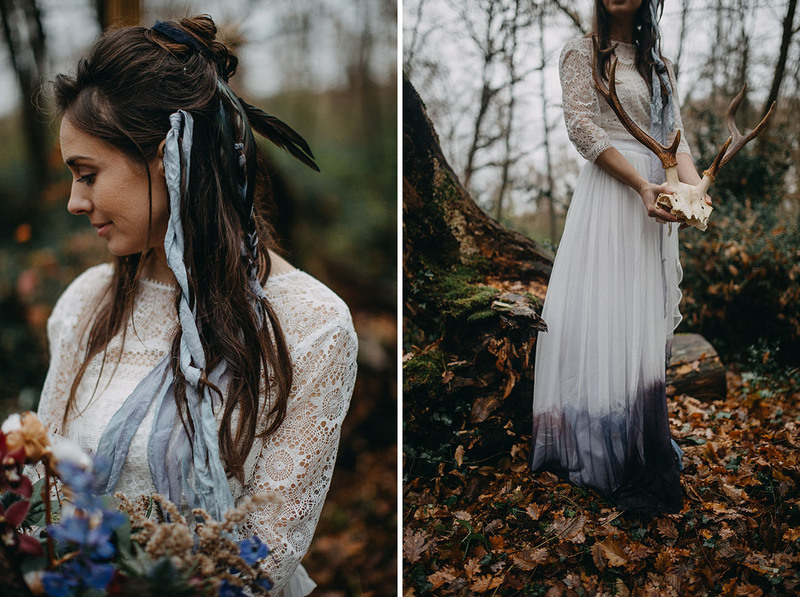 Into the Snow: Ethereal Winter Wedding Inspiration Featuring a Yak!